These questions and activities have been developed to assist small groups discussing the material in RetroSuburbia: the downshifter’s guide to a resilient future. This might be in the form of a book club, or any other group that gets together locally to share their retrosuburban journeys. The ‘Questions’ are starting points for discussion. There are many suggested questions for each chapter so it is likely that you will not cover them all in a meeting – your group may choose to focus on just one or two. Some of these questions will be more relevant to particular groups than others, for instance ‘What is your understanding of permaculture?’ (Chapter 1) might be of interest to everyone, but for local groups that have arisen out of permaculture networks it is probably less useful than it is for groups where many people have no prior experience with permaculture. The activities may be used in different ways – if there is a facilitator for the group, or for the particular meeting, it is useful to read ahead and work out how these will be used. Some activities might be undertaken before the group meeting and discussed in the meeting, others might be done as a group during the meeting. Some, such as the Built field worksheets, might be undertaken as a group on the home where the meeting is hosted then each participant can later do the activity at their own home. Note that some activities require someone with particular expertise – if nobody within the group has this experience, invite someone in. 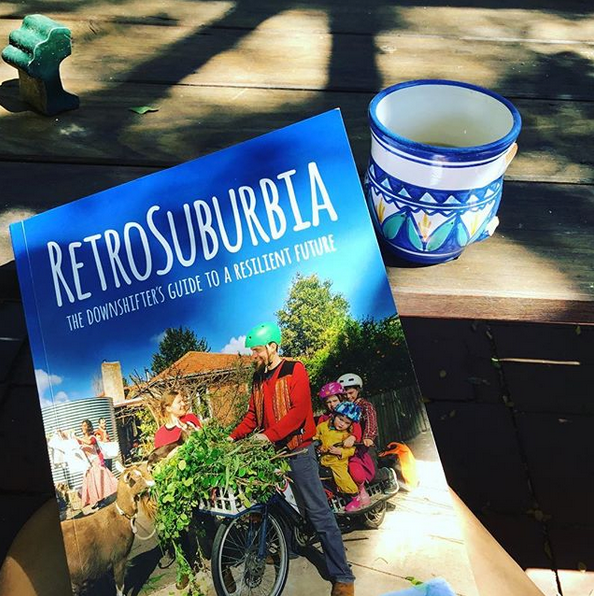 Your group will no doubt find other aspects of each topic to discuss and/or think of more activities to do – please share them on the RetroSuburbia Community Facebook page or Slack group. The Slack group is available to registered book clubs – please get in contact to register. The ‘Resources’ section of each chapter in The Book tab of the website lists further reading (or sometimes watching). Many of these are already mentioned in RetroSuburbia but some are not. We’d love to keep updating these lists so if you find some useful resources for a particular chapter please let us know. Hi, Dylan here, please make these pdfs available as one download as a zipped file, save a lot of time individually downloading each one. Thanks!